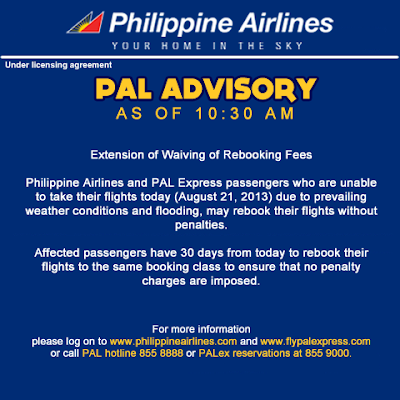 Philippine Airlines and PAL Express passengers who are unable to take their flights today (August 21, 2013) due to prevailing weather conditions and flooding, may rebook their flights without penalties. Affected passengers have 30 days from today to rebook their flights to the same booking class to ensure that no penalty charges are imposed. 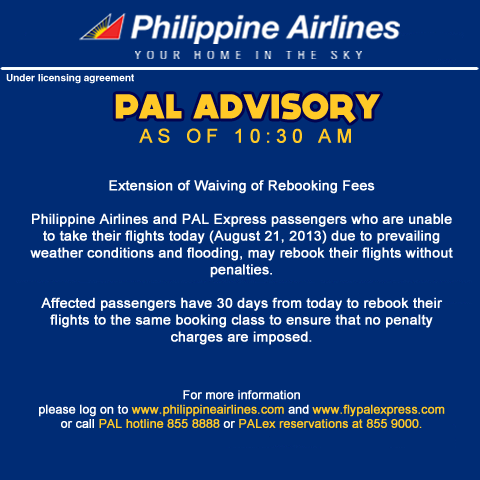 For more information, log on to http://www1.philippineairlines.com/ and http://www.flypalexpress.com/ or call PAL hotline 855-8888 or PALex reservations at 855-9000.